You want the best price on things you buy second hand, but finding out how much you should pay is a hassle. Removing this friction from a lucrative part of the purchase funnel is the goal of Priceonomics. The first startup out of the winter 2012 Y Combinator batch, Priceonomics has crawled the web to compile its next-generation price guide. It launches today featuring 10 million prices on 50,000 products, and plans to expand across verticals soon. Here’s how it works. Let’s say you want to buy a TV on craigslist, a bike on eBay, or something from the TechCrunch holiday gift guide. Visit the site and search for the product. Priceonomics returns an estimate for how much you should pay for it along with a range of prices it’s crawled. It then displays listings of people selling it. 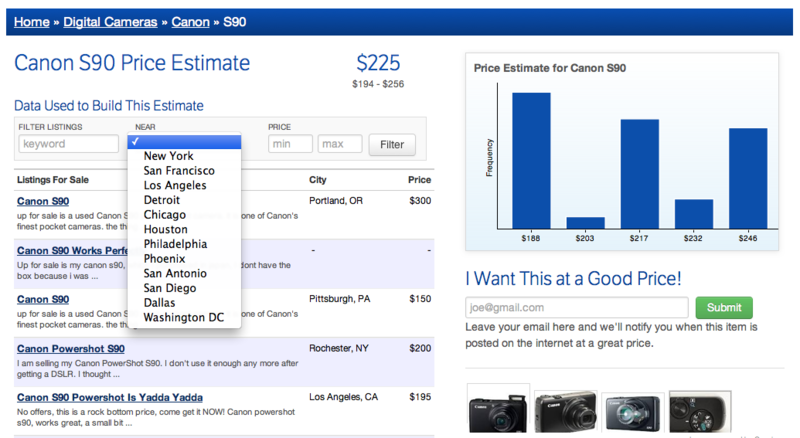 Filter by keyword, proximity, and price to narrow the results. There’s also value to sellers, as they can check how they should be pricing their own products. Most listings I clicked had already been sold, but the site is designed for you to discover what you should pay, not necessarily where to buy. If you can wait a little while, enter your email address and Priceonomics notifies you when the product is posted at a great price. There’s also browsable price guides for specific product types. You could click Computers->Apple->MacBook to discover you should pay about $1000 for this used laptop, or at least somewhere between $682 and $1,318. Currently the site features 71 product types across categories like transportation, cameras, computers, phones, and TVs, but more are on the way. Because it fits into the purchase funnel at the stage where people are clearly trying to buy something, the Priceonomics has big monetization potential. Featured product guides for brands, sponsored search results, traditional display, lead generation, and affiliate links would all work. While the rest of the Winter YC class will launch soon, Priceonomics made a smart push to get out the door today. It may have missed the pre-holiday shopping blitz, but there’ll be plenty of people looking to spend cash gifts or find out whether they should return a new product and buy used instead. Update: I’ve heard back from the Priceonomics team and added several quotes to this article.